حاتمی نصاری, فاطمه, آزاد فلاح, پرویز, ترک, منصور, عیدی بایگی, مجید, قرایی اردکانی, شایسته. (1396). بررسی تاثیر درمان شناختی– رفتاری گروهی بر طرحواره‌های ناسازگار افراد دارای سوء‌ مصرف مواد. سلامت جامعه, 9(2), 10-19. فاطمه حاتمی نصاری; پرویز آزاد فلاح; منصور ترک; مجید عیدی بایگی; شایسته قرایی اردکانی. "بررسی تاثیر درمان شناختی– رفتاری گروهی بر طرحواره‌های ناسازگار افراد دارای سوء‌ مصرف مواد". سلامت جامعه, 9, 2, 1396, 10-19. حاتمی نصاری, فاطمه, آزاد فلاح, پرویز, ترک, منصور, عیدی بایگی, مجید, قرایی اردکانی, شایسته. (1396). 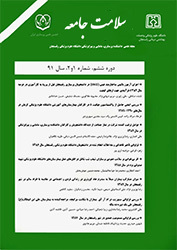 'بررسی تاثیر درمان شناختی– رفتاری گروهی بر طرحواره‌های ناسازگار افراد دارای سوء‌ مصرف مواد', سلامت جامعه, 9(2), pp. 10-19. حاتمی نصاری, فاطمه, آزاد فلاح, پرویز, ترک, منصور, عیدی بایگی, مجید, قرایی اردکانی, شایسته. بررسی تاثیر درمان شناختی– رفتاری گروهی بر طرحواره‌های ناسازگار افراد دارای سوء‌ مصرف مواد. سلامت جامعه, 1396; 9(2): 10-19. مقدمه: ﻃﺮﺣــﻮارهﻫــﺎی ﻧﺎﺳــﺎزﮔﺎر اوﻟﯿــﻪ، اﻟﮕﻮﻫــﺎی ﻫﯿﺠــﺎﻧﯽ و ﺷــﻨﺎﺧﺘﯽ ﺧﻮدآﺳــﯿﺐ رﺳﺎﻧﯽ ﻫﺴﺘﻨﺪ ﮐﻪ ﻣﻨﺠـﺮ ﺑـﻪ شکل ­گیری ﺑﺎورﻫـﺎی ﻏﯿـﺮﻣﻨﻄﻘﯽ ﻣﯽﺷﻮﻧﺪ. لذا هدف پژوهش حاضر بررسی تأثیر درمان شناختی– رفتاری گروهی بر طرحواره­ های ناسازگار افراد دارای سوء مصرف مواد بود. مواد و روش­ ها: پژوهش حاضر پژوهشی نیمه تجربی بوده و طرح پژوهش حاضر پیش آزمون-­­پس­ آزمون با گروه کنترل بوده است. جامعه آماری شامل مردان معتاد مراجعه­ کننده به کلینیک­ های اعتیاد شهرستان کرج در سال 1389 بود. تعداد 30 معتاد به صورت تصادفی به دو گروه آزمایش و کنترل تقسیم شدند. جهت سنجش و ارزیابی آزمودنی­ ها در مرحله پیش­ آزمون و پس ­آزمون از فرم کوتاه پرسشنامه یانگ استفاده گردید. در مورد گروه آزمایش 12 جلسه درمان شناختی- رفتاری اجرا گردید، اما گروه کنترل هیچ مداخله­ ای دریافت ننمودند. پس از اجرای پس ­آزمون داده­ ها با روش تجزیه و تحلیل کوواریانس مورد تجزیه و تحلیل قرار گرفتند. یافته­ ها: نتایج پژوهش حاضر نشان داد که بین دو گروه آزمایش و کنترل پس از اجرای درمان شناختی-رفتاری در حوزه­ های پنجگانه طرحواره تفاوت معنی­ داری وجود دارد (05/0(p<. نتیجه ­گیری: یافته­ های پژوهش حاضرگویای اهمیت درمان شناختی-­رفتاری گروهی بر کاهش طرحواره­ های ناسازگار معتادین می­باشد و با توجه به اهمیت این طرحواره ­ها در ایجاد مشکلات روان شناختی می­تواند جنبه تکمیلی درمان دارویی در بهبود مشکلات روانشاختی همراه با اعتیاد را داشته باشد. Introduction: Early maladaptive schemas are self-damaging emotional and cognitive patterns that lead to the formation of irrational beliefs. Therefore, the purpose of this study was to examine the effectiveness of group cognitive-behavioral therapy on maladaptive schemas of individuals with substance abuse. Materials and Methods: This study was quasi-experimental with pre-test, post-test and control groups. The statistical population of this study consisted of male substance abusers who referred to Methadone Addiction Treatment Clinics of Karaj in 2010. The sample of the study consisted of 30 substance abusers who were selected randomly and were assigned into experimental and control groups. To evaluate the participants in pre-test and post-test, Young's Short Form Questionnaire was used. Participants in the experimental group received group cognitive-behavioral therapy for 12 sessions but participants in the control group received no interventions. After implementing the post-test, data were analyzed using covariance analysis and Spss16 soft ware. Results: The results of this study showed that there was a significant difference between the experimental and the control groupss after implementing cognitive - behavioral therapy in quintuple areas of schema (P< 0.05). Conclusion: The findings of this study suggest the importance of group cognitive-behavioral therapy in reducing maladaptive schemas in substance abusers. Considering the importance of maladaptive schemas in developing psychological problems, group cognitive-behavioral therapy can be a complementary aspect of medical treatment in improving psychological problems associated with addiction. Shives LR, Williams L. Basic concepts of Psychiatric mental health nursing. 8nd ed. Philadelphia: Lippincott William & wilkins; 2010: 403-30. Rooke SE, Hine DW, Thorsteinsson EB. Implicit cognition and substance use: a meta-analysis. Addictive behaviors 2008;33(10):1314-28. Birch CD, Stewart SH, Zack M. Emotion and motive effects on drug-related cognition. Handbook of implicit cognition and addiction. 1nd ed. London: Sage Publications; 2006:267-80. Young JE. Cognitive therapy for personality disorders: A schema focused approach. 3nd ed. Sarasota FL: Professional Resources Press; 1999: 23-37. Van Vreeswijk M, Broersen J, Nadort M. The Wiley-Blackwell Handbook of Schema Therapy Theory, Research, and Practice. 1nd ed. New York: John wiley & Sons; 2012: 27-41. Cecero JJ, Marmon TS, Beitel M, Hutz A, Jones C. Images of mother, self, and God as predictors of dysphoria in non-clinical samples. Personality and individual differences 2004;36(7):1669-80. Delattre V, Servant D, Rusinek S, Lorette C, Parquet P, Goudemand M, et al. The early maladaptive schemas: a study in adult patients with anxiety disorders. L'Encephale 2003;30(3):255-8. Welburn K, Coristine M, Dagg P, Pontefract A, Jordan S. The Schema Questionnaire—Short Form: Factor analysis and relationship between schemas and symptoms. Cognitive Therapy and Research 2002;26(4):519-30. Young JE, Gluhoski VL. Schema focused diagnosis for personality disorders. In: Kaslowed FW. Handbook of relational diagnosis and dysfunctional family patterns. 1nd ed. New York: Wiley; 1996: 300-21. Dale R, Power K, Kane S, Stewart AM, Murray L. The role of parental bonding and early maladaptive schemas in the risk of suicidal behavior repetition. Archives of Suicide Research 2010;14(4):311-28. Wang CE, Halvorsen M, Eisemann M, Waterloo K. Stability of dysfunctional attitudes and early maladaptive schemas: A 9-year follow-up study of clinically depressed subjects. Journal of Behavior Therapy and Experimental Psychiatry 2010;41(4):389-96. Gelder M, Gath D, Mayou R, Cowen P. Oxford textbook of psychiatry. 3nd ed. Oxford: Oxford University Press; 1996: 3. Carroll KM, Onken LS. Behavioral therapies for drug abuse. Am J Psychiatry 2005; 162 (8): 1452-60. McKay JR. Lessons learned from psychotherapy research. Alcoholism: Clinical and Experimental Research 2007;31(s3):48s-54s. Tucker JA, Donovan DM, Marlatt G. Changing in addictive behavior: bridging clinical and public health strategies. 7nd ed. New York: The Guilford press; 1999: 127-60. French MT, Roebuck MC, Dennis ML, Godley SH, Liddle HA, Tims FM. Outpatient marijuana treatment for adolescents economic evaluation of a multisite field experiment. Evaluation Review 2003;27(4):421-59. Dobson KS, Hollon SD, Dimidjian S, Schmaling KB, Kohlenberg RJ, Gallop RJ, et al. Randomized trial of behavioral activation, cognitive therapy, and antidepressant medication in the prevention of relapse and recurrence in major depression. Journal of consulting and clinical psychology 2008;76(3):468-77. Farrell JM, Shaw LA, Webber MA. A schema-focused approach to group psychotherapy for outpatients with borderline personality disorder: A randomized controlled trial. Journal of Behavior Therapy and Experimental Psychiatry 2009; 4 (2): 317-28. Hawke LD, Provencher MD, Parikh SV. Schema therapy for bipolar disorder: A conceptual model and future directions. Journal of Affective Disorders 2013; 148 (1): 118-22. Young JE, Klosko JS, Weishaar ME. Schema Therapy: A Practitioner's Guide. 9nd ed. New York: The Guilford press; 2003: 23-64. Oei TP, Baranoff J. Young Schema Questionnaire: Review of psychometric and measurement issues. Australian Journal of Psychology 2007;59(2):78-86. Ball SA. Manualized treatment for substance abusers with personality disorders: dual focus schema therapy. Addictive Behaviors 1998;23(6):883-91. Afshari R, Zare I, Moin L, Naziri Gh, Naghavi MR. Explain the effectiveness of schema therapy approach to the problems individual Category B men's drug-dependent. Journal of Psychological Methods and Models 2011; 1 (4): 119-135. [Persian]. Naseri E, Sohrabi F, Borjali A, Falsefinejad MR. The effectiveness dual focus schema therapy in the treatment of heroin dependence comorbid antisocial personality disorder. Journal of Clinical Psychology 2015; 18 (5): 75-97. [Persian]. Afshari R, Zare I, Moin L, Naziri Gh, Naghavi MR. Explain the effectiveness group Schema Therapy on personality disorders cluster B of men addicted. Journal of Psychological Models and Methods 2011; 1 (4): 119-135. [Persian]. Ball SA. Comparing individual therapies for personality disordered opioid dependent patients. Journal of personality disorders 2007;21(3):305-21. Clark DA, Beck AT, Alford BA. Scientific foundation of cognitive theory and therapy of depression. 1nd ed. New York: John wiley & Sons; 1999: 54-76. Gilbert P, Leahy RL. The therapeutic relationship in the cognitive behavioral psychotherapies. 1nd ed. New York: Routledge; 2007; 43-63.